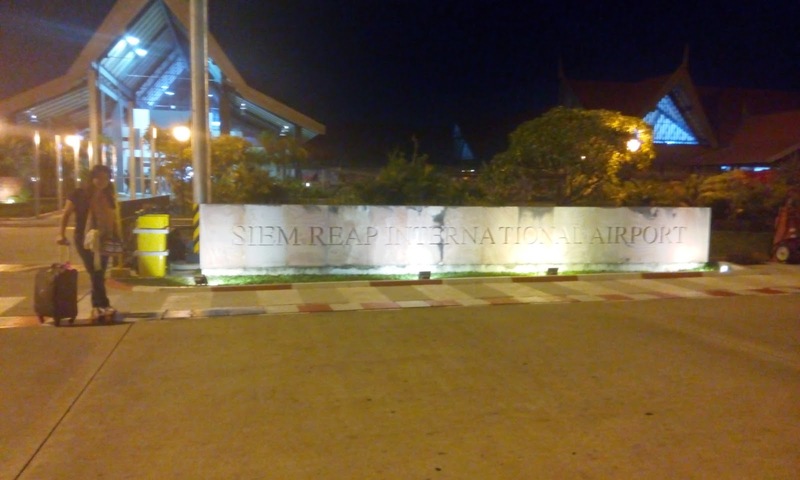 We just landed in Siem Reap International Airport. There are friendly airport staff nearby to assist you just in case you want to have a photo taken. At first, we thought that the staff wanted us to walk fast and go inside the immigration, a bit late when we realized that they're hovering near us just in case we need a photographer. Thumbs up! 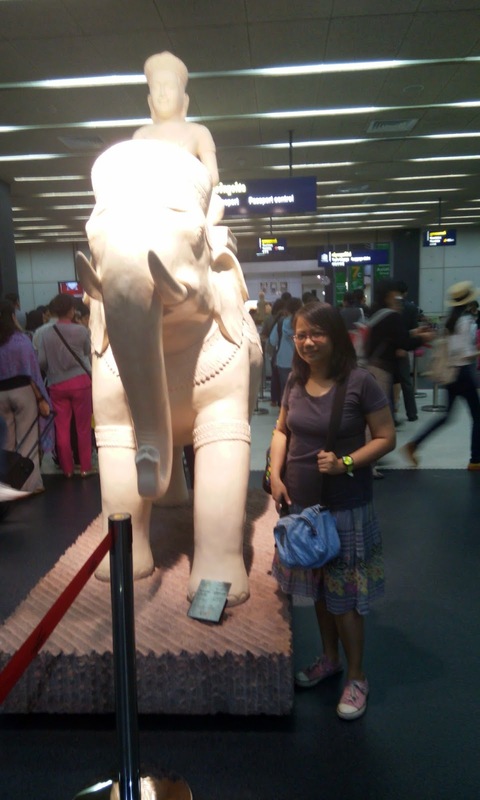 This elephant stands right after the immigration counter. Just in case you see some people with dollars on their passport at the immigration counter, don't panic. 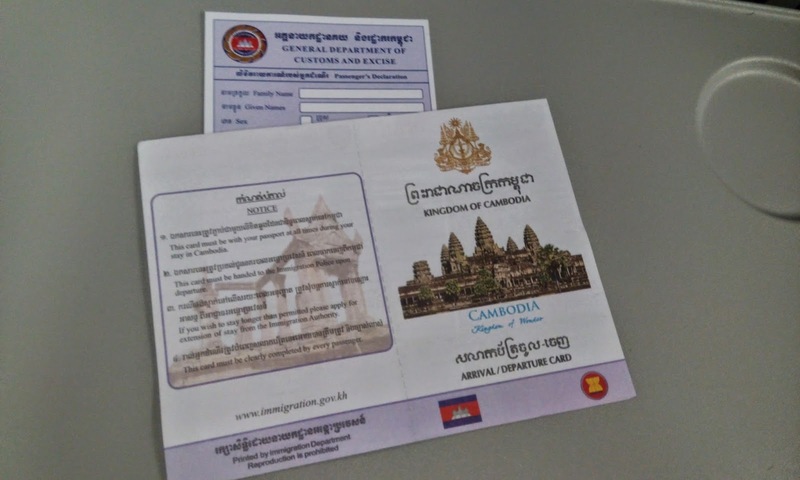 Philippine passport holders are exempted to get tourist visa in Cambodia and may stay up to 30 days in the country. Visit this link for more information. Lucky us- the hotel where we are going to stay has a free "tuktuk" pick-up at the airport. 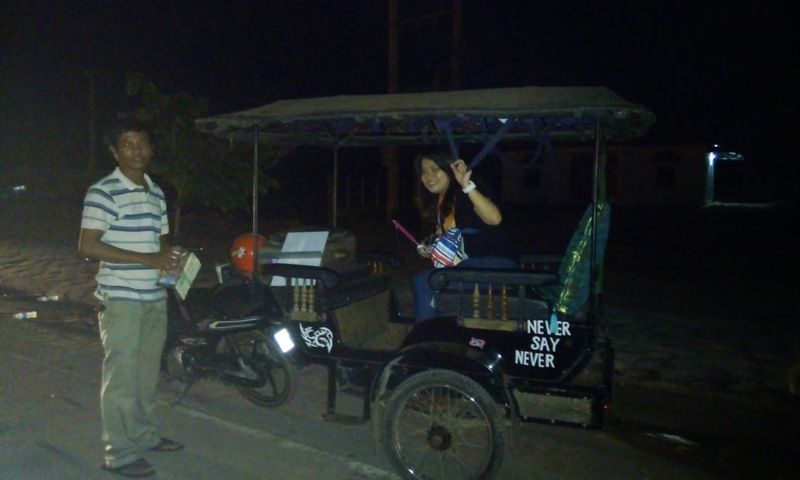 Tuktuk is the public transportation in Siem Reap. It looks like a carriage sans the horse but we feel like princesses as it weaves its way from the airport up to the hotel. Its also a good thing that our driver knows how to speak english. 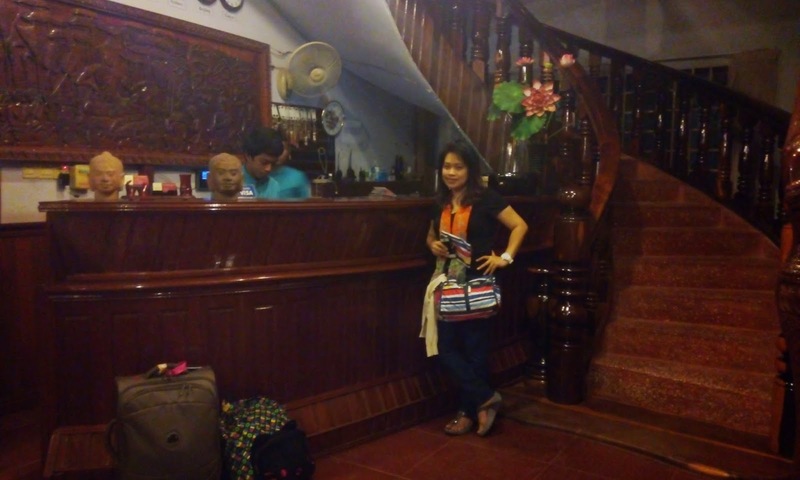 It was late when we arrived at the Rithy Rine Hotel but the staff are eagerly waiting our arrival with cheerful faces. This was about 10:30pm already. We weren't able to have dinner since our flight left Manila at 8pm so we decided to go out of the hotel and search for food. 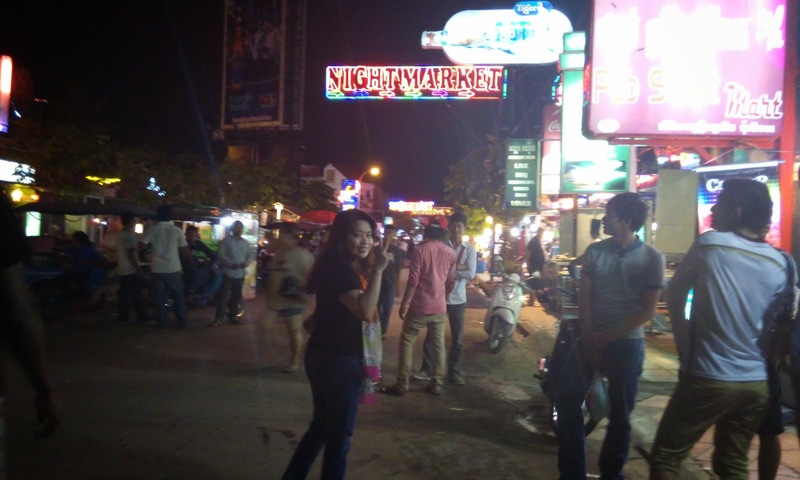 Pub Street and the Night Market area are a short ride away from the hotel and is also walking distance. We made the mistake of riding another tuktuk and paying the driver $2 when it should have costs us only $1 since it's just a short ride away. Walking is also possible. Oh well, lesson learned. 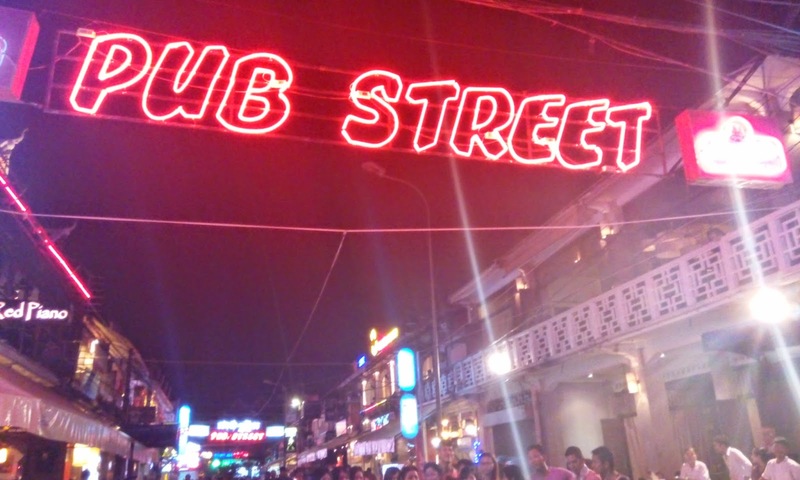 Pub Street is quite popular in Siem Reap because of the numerous bars around the area, not to mention that almost all visitors to the city converge here every evening to have a good time. Dancing, eating, drinking, smoking, chatting, etc. But we're hungry so we skipped the bars and searched for food. Want to know what we had for our midnight dinner? Please visit this link.